The 2-year programme, which begins in April 2013, offers a focus on practical and entrepreneurship skills in the area of culinary and food service operations, with specialisation in Kitchen & Larder and Patisserie. 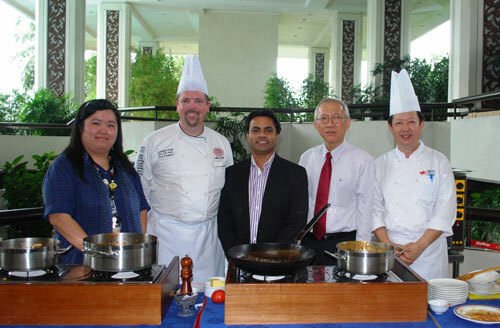 Koetke (2nd from left) poses with (from left) Khoo; Rohit Sharma, INTI’s Chief Operating Officer; Dr. Michael Yap, INTI International College Penang’s Chief Executive; and Chef Lee Teik Liang, INTI International College Subang’s Culinary Coordinator of the School of Hospitality. “At Kendall College, our intensive, hands-on, cutting-edge programmes are designed to successfully launch culinary careers and make our graduates more competitive job candidates. Our unique combination of a rigorous culinary curriculum, business training and specialized advanced coursework transcends traditional teaching and learning to cultivate the essential skills needed to achieve culinary excellence. We are extending our philosophies to INTI’s students and are excited to work with lecturers to enhance international and real-world exposure for their students,” said Chef Chris Koetke, Vice President of Kendall College School of Culinary Arts and Laureate International Universities Centre of Excellence in Culinary Arts. As Kendall School of Culinary Arts is ranked No. 1 by Chicago Michelin Guide Restaurants for preparing students for culinary arts careers, students can be assured of stringent quality control on syllabus and assessment. They can also expect to be well groomed via the internship programmes with established hospitality and tourism organizations, government sectors, airlines, and more. Students who successfully complete the programme will receive dual certification from INTI and Kendall College, a unique offering not currently provided by other private educators in Penang. The qualification allows one to pursue more than just a career within the kitchen and hotels. Graduates can venture into research and development, start their own business, work for top hotels and restaurants and travel around the world. “Under the instruction of award-winning Chef Syamsul, students will be trained to develop leadership qualities, confidence and resourcefulness, as well as learn how to analyse, strategize and make quick decisions. All these will give the students a distinct advantage as they advance to higher studies or challenging careers. The comprehensive curriculum also covers field trips, seminars and workshops to prepare them for the workplace,” said Christine Khoo, INTI International College Penang’s Head of Programme, School of Hospitality. The international reputation of INTI International College Penang is based on world-class academic programmes combined with high quality industry internship programmes in Malaysia and abroad. In addition, state-of-the-art facilities and the development of strong management, interpersonal, language and cultural skills provide INTI graduates a distinct edge over their peers. Students benefit not only from INTI’s over 25 years of experience and strong track-record, but also gain from the global synergy and resources that Laureate International Universities provides. Laureate is the world’s largest private education network with a presence in 29 countries, with more than 65 accredited campus-based and online universities and 130 campuses, serving over 750,000 students globally. For more information on INTI’s new culinary arts programme, call 04-631 0138. * Conclusion of a survey of management at Chicago MICHELIN Guide restaurants (ORC International – 2011 Survey).